Is there any look more effortlessly chic than the boyfriend sweater? This new-age wardrobe staple gets its name because it mimics the styles you’d find in your bf’s closet—it’s made to be cozy and oversized. The result is a cute, easy to toss on layer that’s totally low-effort yet amazingly high-style. Plus, it’s the hottest fashion trend of the season! 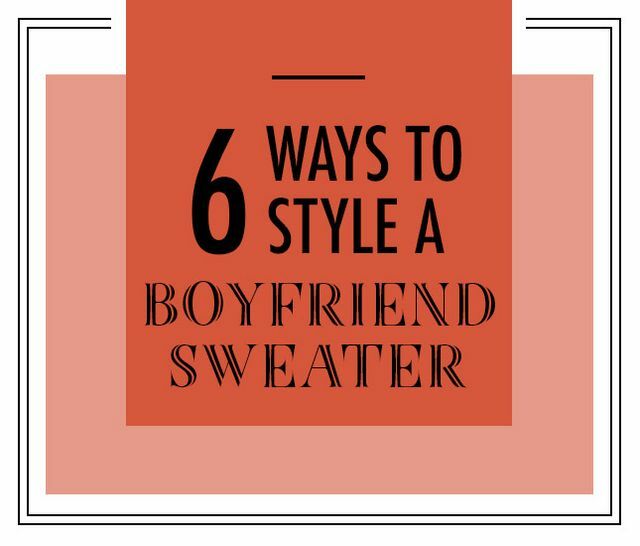 Our best tip for rocking the boyfriend sweater is to skip the part where you raid your man’s closet and opt instead for a sweater that’s made to flatter. Buying new also means you can get a monogrammed style to make it all you! Here are some excellent ways to style this comfy fall essential so it becomes a fast favorite. 1. Minimalist: Skinny Jeans or Leggings—Arguably the most classic way to style a bf sweater is with skinny jeans or leggings. The oversized, roomy nature of this top means it pairs perfectly with some well-tailored bottoms and a pair of statement shoes. It also allows you to show off your figure despite the flowy top. Naturally, you can partner yours with some stylish fall boots to tie together the cozy look or sport it with some comfy flats for a day on campus or out on the town. Keep it chic and understated with solid colors and classic shoes. Maybe a pair of monogrammed loafers to match? 2. Preppy: Over a Collared Shirt—Want to give your style some prep school vibes? Even though we usually envision the sweater-over-collared-shirt with a traditionally tailored sweater, it can work well with your boyfriend sweater, too. This option also helps dress up your look ever so slightly so that you don’t feel sloppy or tossed together in more dressy situations, like at work or happy hour. When paired with some riding boots, this look is for the books. 3. Rock and Roll: With a Denim Jacket—By its very nature, the oversized sweater is inherently edgy—it feels like you’re breaking a style rule, and that’s why it’s so desirable. To pump up the punk charm, style yours with a denim jacket (patches and studs optional) and some leather ankle boots. Obviously, you can’t go wrong with some destroyed or acid-washed jeans when you go for this look. 4. Warm and Cozy: Beneath a Quilted Vest—Oversized sweaters are the perfect pick for warm fall styles, as they’re super easy to integrate with your trendy outerwear. One of our favorite ways to wear this staple in the fall and winter is beneath a quilted vest. This gives your look a sort of British prep aesthetic and keeps you warm at the pumpkin patch or when you’re out shopping for holiday gifts. Your always-versatile riding boots are a must with this style, too! 5. Original: With the Sleeves Cuffed—Cuffing your sleeves is a great way to play to the idea that your top was plucked from your boyfriend’s closet and you had to make quick adjustments so it fits you properly. We love the idea of styling it with a long-sleeved undershirt so that you can roll your sleeves and add a little contrast to your cuffs. This also makes your look a little more appropriate for wear in warmer weather. 6. Breezy: With Shorts—We are mega-fans of the sweater-with-shorts look for a multitude of reasons! For one: It helps you extend your favorite pair of shorts well into the fall (as long as it’s warm enough where you live). For two: It means you can integrate some comfy knits into your warm weather wardrobe, especially on cool summer nights. This season, it’s all about the mom shorts—Bermudas and high-waisted cutoffs, of course—but you can totally give this style a preppy look with some pleated or linen shorts if that’s your thing. There are hundreds of great ways you can style the boyfriend sweater, allowing for a ton of different outfits that work for any occasion year-round. 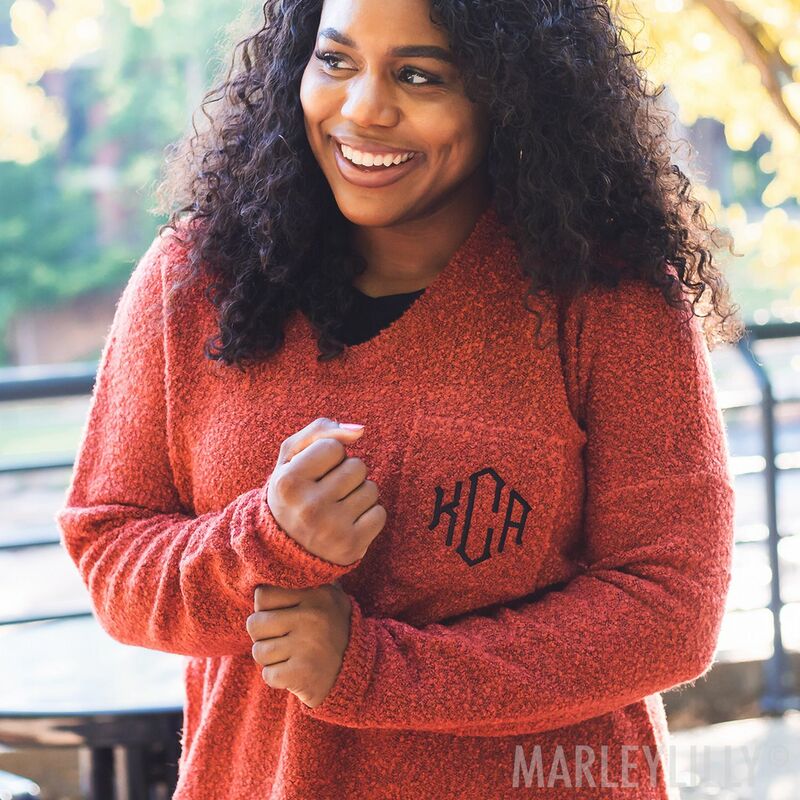 The monogrammed bf sweater is an absolute must-have for fall, so be sure to pick one up alongside a good blanket scarf, some go-with-anything boots and a few lightweight jackets to complete your cool-weather wardrobe!